No matter your fashion sense, there are styles that a modern mom can incorporate in a wardrobe that contain the latest in fashion trends, yet are easy enough to integrate within a current wardrobe, or add spark to a new one. Latest styles that definitely should not be missed include some old standards from the past that have an upgraded edge along with a few totally new and surprising items that will inspire fashion conscious modern moms. Here are five of the latest styles that should not be missed. The utilitarian or work clothes look seems to have taken the streets and runways by storm. Jumpsuits (boiler suits) similar to those all-in-one long-sleeved overalls that have been used forever in manual labor jobs have suddenly become a design to emulate. They certainly are one standout piece that can be found in any number of styles, fabrics and colors. Some boiler suits have button down fronts as well as zippers, grommets and fabric ties. Straight and fuller legs at ankle and above ankle lengths are easy to coordinate with a casual sports shoe, flat or work boot, along with other accessory items. With lightweight fabric choices that convey comfort and ease, modern moms will love the look and the convenience of popping on one item as opposed to two, three or four. Bold and vivid animal prints have gone beyond the usual long-standing and recognizable prints of earlier fashion trends. Animal prints today offer loud and striking background colors, particularly with the leopard print theme. This print continues to be consistently in the lineup of latest fashion trends. Whether a leopard print appears in a dress, pants, coats, or accessory items, such as scarves, handbags and even shoes, leopard prints continue to be a dominating force. Current leopard print designs are more striking and immersed in other colors besides the traditional and classic leopard that has a more neutral look with golden brown spots, black outlining and touches of white. Leopard prints today are larger, more pronounced and highlighted. 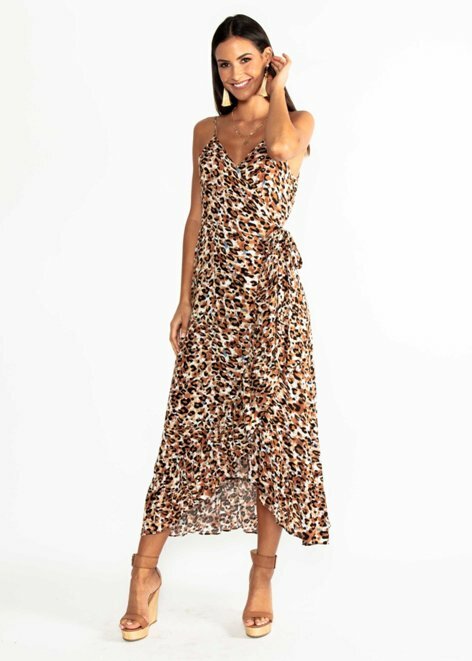 Whatever animal print selection a modern mom decides to try, whether it's an all-over effect or small touches in a handbag or shoes, she won't be out of style with an animal print in hand, as the trend continues to influence fashion. Patchwork fabric has taken an upswing in style trends and has graduated from grandma's quilting basket and craft room scrap bag to clothing designs from around the world. Patchwork has found its way to jeans, pants, jackets, dresses, long skirts and accessory items. Maybe you're more of a gingham and heels mom when it comes to choosing print fabrics and shoes, but patchwork has gained fashion headway because of its long standing use in quilting and other fabric crafts. The look has been reworked in clothing pieces. It's amazing how a few pieces of fabric sewn together can present a diverse and captivating design. A patchwork skirt can become the focal point of an entire outfit. Simple additions of jewelry, the right flats or sandals and a color block top can complete the ensemble. Any modern mom should not miss indulging her fashion sense in a patchwork piece. Modern moms are saying, Oh no, not shorts with a jacket or blazer. I can't wear a hot pantsuit look from the dark ages. My figure has gone south. Well, shorts have changed since then, as they are more tailored as well as slimming. One of the hottest ongoing trends is athletically inspired clothing, like stretch bike shorts. These comfy shorts are paired with a contrasting blazer or longer jacket to create a short suit effect. The result is a chic and comfortable outfit for any modern mom to indulge in and enjoy. It's a look that can go from a trip to the gym to a stroll in the park with the baby and kids to a casual outdoor picnic or barbecue. Ruffled, puffed, ruched and various combinations of the same are recurring trends in sleeves that speak to dimension and femininity. A modern mom might prefer the minimalist approach in design, but puffed sleeves in garments can bring a lighthearted and fun look to a design. Puffed and balloon sleeves of almost any configuration, fullness, size or length are seen in everyday dresses, evening wear, open jackets, blouses, tops, sweaters and jumpsuits. Puffed sleeves can create a wow and showstopper effect, but they can be overwhelming if not tamed with a more restrained look that extends beyond the sleeves. Right along with puffed sleeves, ruffles and frills are a once and again trend. Ruffles have made another entrance to the modern fashion scene. Ruffled layers are seen in extravagant dresses along with frills and flourishes that add to a full and flouncy look, but there is more. Ruffles adorn sweaters, knit tops, shift dresses, jogging pants, shirts, bustier and crop tops as well as bathing suits, shoes, boots and handbags. There is no end to what ruffles, frills and flourishes can do for a playful and fun garment but, like puffed sleeves, ruffles have their limits. Most modern moms are curious about and want to know the latest fashion styles and trends. They want fashion that is going to inspire them. Not every style is going to be a blockbuster, but it does help to know and be aware of what's out there. The information alone can be of help in upgrading and jump-starting a fashion conscious wardrobe. The latest styles can be fun, comfortable and serve multiple purposes, and oftentimes those styles or trends can become constants and classics in fashion. In spite of the pressure to follow current fashion designs, styles and trends, what's important is that they fit a modern mom's needs and body type. Most moms want to figure out what styles are relevant to them and develop their own fashion sense. Understanding latest styles and trends can be of considerable help to a modern mom, and they should not be missed.